I’m officially a VIBER. That’s right, I’ve joined Midtown’s VIBE Tribe and I’m not looking back. I’m the first to admit that I have zero rhythm, but I love to dance. And I’m thrilled to add Midtown’s RIDE studio as my new favorite place to dance during VIBE, a 45-minute “party on the bike” cycle class. As you may have guessed from the name, this class is driven entirely by a playlist of high-energy music as VIBERS focus on revolutions per minutes (RPM), or as we like to call them, rhythms per minute. 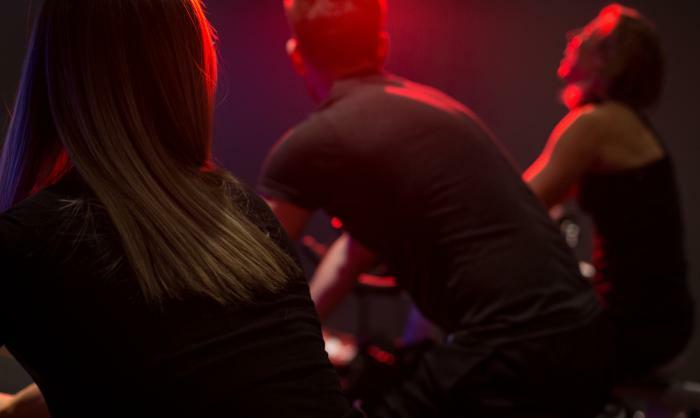 From Beyoncé’s greatest hits to heart thumbing EDM, it’s impossible to keep from dancing on your bike, especially with a little choreography incorporated into each class. You heard me right, at the beginning of class, the instructor walks you through any choreography you’ll need to know during the workout. And before you let the thought of choreography scare you away, you should know that all moves focus primarily on the upper body and can easily be performed by my fellow rhythm-challenged friends. The instructor also sets an intention for the class. VIBERS are asked to think about what you're riding for and use this intention as motivation for the 45-minute ride. After you have your swagger down and you’re warm up finished, it’s time to really crank the music and start working. When you think of VIBE’s class structure, think non-traditional. In a traditional cycle class, riders climb peaks and sprint flat straightaways, but in VIBE, you let the beat of our favorite artists’ songs dictate the intensity of your cadence. Not to mention, the instructor finds time to get out of the bike to spread good vibes throughout the room. And the best part is, every class features one track of freestyle where VIBERS have the opportunity to feel the beat and do your own thing. Yes, even if it’s just a recovery spin. Honestly, the entire class is like a music festival – I’m sweating profusely while dancing with a crowd of people to my favorite artists singing my favorite songs. Only difference is there’s no vodka in my water bottle. For all those music motived, let’s dance in RIDE starting June 9. More of a traditional cyclist? Learn about our PWR class.